A collection letter is sent to a client in case of an overdue payment. It is a professionally drafted letter which maintains an official tone. The letter serves as a reminder to clients who have not made the due payment for a purchase or services. Although it seems like an easy task to compose a collection letter, the job must be done very carefully. It must be borne in mind that the client should not feel offended by the tone of the letter. Therefore, the writer must choose the right words which convey the message in a firm yet polite manner. A collection letter may be sent multiple times in case there is no response from the client. In this scenario, the tone of the letter becomes firmer with each subsequent reminder. Ultimately, the letter may also issue a warning to use legal action if the client further delays the payment. An effective collection letter helps business owners and creditors receive their due payments promptly without straining their business relationship with clients. The following tips can help you compose such a letter successfully. A collection letter should deliver a clear message to the client. State the purpose of the letter right at the beginning. Using the first paragraph for any other details may lead to confusion about the primary aim of the letter which will render it ineffective. In order to make your client take this letter seriously, it should be stated distinctly that this is a reminder for an overdue payment. Although the letter should be precise, important details should not be missed out. These essential details include the total amount of the overdue payment and the date by which the requested amount must be paid. A preferred method of payment should also be explained in order to make the transaction more convenient for both the parties. In addition, brief details about the services or consignment for which the payment has been requested should also be mentioned. Including these components in the letter makes it complete. It is important to make sure that the client does not feel offended by the tone of the letter. The main aim is to provide a reminder while maintaining good business relations with the client. For this purpose, the writer can use phrases like “thank you for doing business with us” or “thanking you in anticipation for your payment”. At the same time, the objective of the letter should be stated firmly so that the receiver considers it seriously and takes the required action. Dealing with clients who delay the due payment without a valid reason puts business owners and creditors in a difficult situation. However, it is important to maintain a professional tone in a collection letter no matter how irksome a customer may seem. It should be remembered that any type of correspondence with clients represents a business. Such written correspondence can be used as a record by the clients against a business in case any inappropriate words or tone are used. Therefore, state the purpose in a professional tone. Your consignment was delivered to you on 20th December 2019. According to our records, you have still not made the payment amounting to $495/-. This is a reminder that your payment is overdue. We request you to clear your dues within this week. The payment details are attached to the bill. As per the company’s policy, customers are supposed to make their due payments no later than 10 days after they receive their delivery. During this period of 10 days, clients can report to us in case of any defects or other problems with the delivered items. We support a policy of complete customer satisfaction. Therefore, we allow the exchange and return of defective goods within 10 days. However, in your case, it has been 15 days since the delivery and we have still not heard from you. Kindly inform us if there is any problem with the consignment which has subsequently caused you to hold up our payment. Since you are one of our valued clients, we would like to know what has caused the delay in the payment so that we may help you out. Kindly email us at 123@customercare.com or call us at 123456. Our customer care representative is available from 9 am to 6 pm. 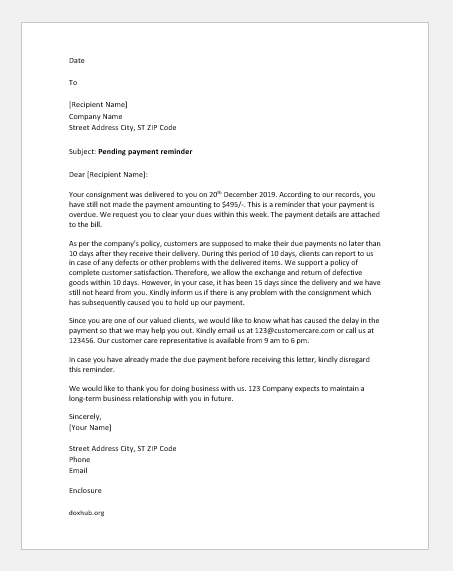 In case you have already made the due payment before receiving this letter, kindly disregard this reminder. We would like to thank you for doing business with us. 123 Company expects to maintain a long-term business relationship with you in future.